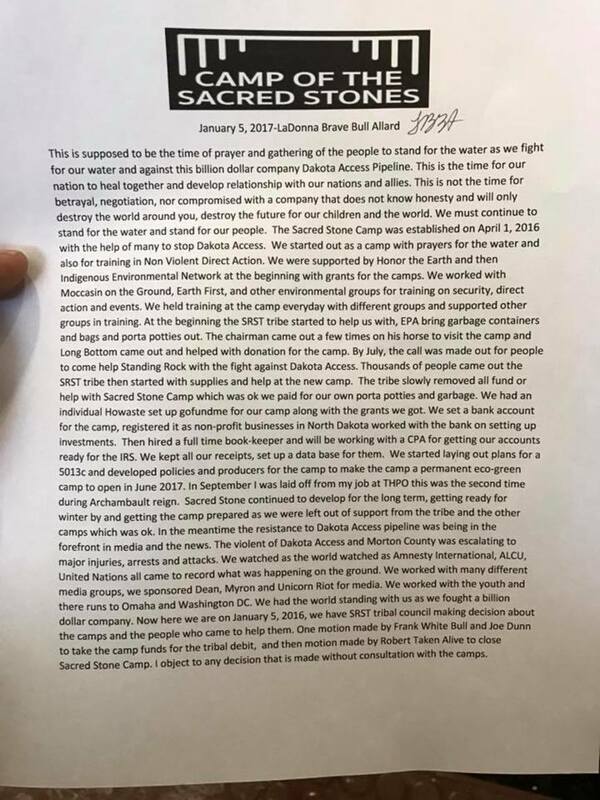 Cannon Ball, ND — In an astonishingly abrupt move, the Standing Rock Sioux Tribe Council went rogue and voted to shut down the Camp of the Sacred Stones — the original encampment set up by Indigenous youth — and to apply all funds donated in support of the camps to pay off the tribe’s debts. “This is supposed to be the time of prayer and gathering of the people to stand for the water as we fight for our water and against this billion dollar company Dakota Access Pipeline. This is the time for our nation to heal together and develop relationships with our nations and allies. Standing Rock Tribe Chairman Dave Archambault II — long believed by some to be corrupt — claimed in the meeting the camps have rampant health and hygiene issues and must be shut down. That assertion has been disputed by among tribal members and other water protectors who have spent time in the camps — particularly as the tribe had claimed in the past it supported opposition to the pipeline’s construction. But after a chain of celebrities, a group of military veterans, and other notable people visited the camp, it seemed too much attention was trained on the tribe — and its politics. Now, two council members under Archambault’s guidance, have proposed a tragic end to the oldest camp in Standing Rock — and the complete removal of all water protectors who have called the site home — some of them since opposition to Dakota Access began. Indeed, some water protectors gave up their lives to support opposition to Dakota Access — leaving behind jobs, friends, and, in some cases, families for months at a time. Many intended to stay for the duration — until the construction is halted. Many well-meaning outsiders have also been at least somewhat betrayed, as they would have assumed monetary contributions given in support of the camps would be applied exactly to that — not to the Standing Rock Tribe to do with as it pleased. So, this sudden move — although not entirely unexpected — sends a shock to the heart of hundreds encamped at Sacred Stone and thousands more enduring the bitter and relentless North Dakota winter in several camps nearby. Archambault previously used the cover of a delay imposed by the U.S. Army Corps of Engineers to declare, falsely, a victory over Dakota Access and attempted to effect a mass evacuation of water protectors. After that announcement, the atmosphere became noticeably hostile at Standing Rock, as leaders seemed to both worry for campers’ safety in the subzero temperatures — and resent their massive presence. “In the meantime, the resistance to Dakota Access Pipeline was being in the forefront in media and the news. The violence of Dakota Access and Morton County was escalating to major injuries, arrests and attacks. We watched as the world watched as Amnesty International, ACLU, United Nations all came to record what was happening on the ground. We worked with many different media groups, we sponsored Dean, Myron and Unicorn Riot for media. We worked with the youth and their runs to Omaha and Washington DC. We had the world standing with us as we fought a billion dollar company. Confirming suspicions, Archambault, White Bull, and Dunn have now broken the ultimate promise — that opposition to the Dakota Access Pipeline would last until the ‘black snake’ had been shut down completely — in one stunning move contrary to everything the Standing Rock Sioux Tribe claimed to hold sacred. It’s imperative to note the tribe council isn’t acting on behalf of all its members as it claims — many want all of the camps to remain in place until the permanent end to Dakota Access. It’s additionally imperative to note the Camp of the Sacred Stones stands on private property — a vote to clear the camp for any reason isn’t likely to carry weight. Concerns about camps being located in a flood plain might be valid during the springtime thaw, but that won’t occur until April or May. Water protectors remain resolute in opposing a pipeline with the potential to contaminate precious water — and have, indeed, sparked a phenomenally important movement to stand against the greed and recklessness of Big Oil. Thousands staying in the encampments have formed a new, fully-functioning society of prayerful, peaceful opposition — precisely as had been the intention from the beginning. However, that Water Is Life, Mni Wiconi, is apparently of little concern — for a select group of people — when money and corruption instead take precedence. NOTE: This article has been updated for purposes of clarification.